Modern metal braces are much smaller and more comfortable than before. Its small size allows for greater patient comfort and better oral hygiene! They are the most common type of braces used for kids and teens but they’re also an option for adults, particularly for those who are budget-conscious. 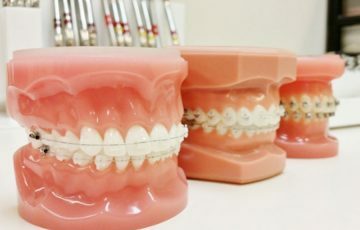 Clear braces work in precisely the same way as traditional metal braces and produce the same results but are aimed at patients needing aesthetically pleasing orthodontic treatment. Clear braces are either tooth coloured or completely clear producing both aesthetically pleasing and efficient braces. It can used with tooth coloured wires to make them even less visible. Incognito hidden braces are high-tech lingual braces which are 100% custom designed ONLY FOR YOU! Incognito braces are attached to the inside of your teeth which means they are completely invisible! Its remarkable flat design of gold alloy brackets provides maximum patient comfort and rapid adaptation to speech, perfect for those who are conscious about the look of braces. When you wear Incognito braces, you can smile with confidence. Invisalign will straighten teeth without the need for braces which means you can enjoy the convenience and flexibility while eating and brushing. By using a sequence of removable clear aligners that are translucent and nearly invisible, it aligns crooked teeth but are not suited to every situation. There is a wide range of functional appliances to correct bite problems and facial imbalances. Although functional appliances are mainly used in patients who are still growing, the cellular and biological responses in adults to the appliances are essentially the same. Our clinic utilises functional appliances such as expanders and headgear for young patients and a modified approach to achieve an effective outcome for adult patients with less discomfort.